5.2, Seminar: readings in key thinkers in the Mediaeval Church: Gregory the Great, Thomas Aquinas and Francis of Assisi. There is a story in the Orthodox Church that when Vladimir, Prince of Kiev, was still a pagan at the end of the 10th century, he sent out envoys to discover what was the true religion and to advise him on which religion should be the state religion. In Germany and Rome, they found the worship and liturgy was without beauty. 1, Nicaea I (325), summoned by the Emperor Constantine, condemned the view of Arius that the Son is a created being inferior to the Father. 2, Constantinople I (381), called by Theodosios I, defined the nature of the Holy Spirit against those asserting the Spirit’s inequality with the Father and the Son. This council marks the end of the Arian conflict in the Eastern Empire. 3, Ephesus (431), summoned by Theodosios II, reaffirmed the Creed of Nicaea and that Mary is truly “Birth giver” or “Mother” of God (Theotokos), contrary to the teachings of Nestorius. 4, Chalcedon (451), called by the Emperor Marcian, affirmed that Christ Jesus is truly God and truly man, without mixture of the two natures, contrary to Monophysite teachings. 5, Constantinople II (553), convoked by the Emperor Justinian, interpreted the decrees of Chalcedon, further explaining the relationship of the two natures of Christ. It also condemned the teachings of Origen on the pre-existence of the soul. 6, Constantinople III (681) declared that Christ has two wills of his two natures, divine and human, contrary to the teachings of the Monothelites. The rise and expansion of Islam had devastating impacts on three (and eventually four) of those five Churches: Jerusalem, Antioch and Alexandria and finally Constantinople. Meanwhile, after the assaults and invasions by the Barbarians and the Vikings, Western Christianity appeared to triumph in the face of adversity, with the development of monastic life and a new relationship between Church and State. The development of Western Monasticism follows the development of Eastern Orthodox monasticism in the Western Desert of Egypt, in Syria and in Cappadocia, where Saint Basil developed a rule that influenced Saint Benedict. The Eastern tradition of monasticism later flowered in monasteries such as Mount Athos, Mount Sinai and Patmos. We may recall that the filioque clause was inserted in the Latin version of the Nicene Creed used in the West, so that by 800 it was being used in the chapels of Charlemagne. At first its use was opposed by the Popes, and East and West agreed in Constantinople in 879 that all additions to the Creed were prohibited. But it was soon accepted quiescently; and finally it was accepted without any conciliar approval and against the wishes of the Church in the East, to the point that delegates from Rome to Constantinople even accused the Greeks of removing the filioque from the Creed. The debate about the filioque was a result of – rather than the cause of – the divisions between East and West. On16 July 1054, the Papal Legate, Cardinal Humbert, stormed into Aghia Sophia with his retinue, interrupted the Divine Liturgy, marched up to the high altar, and laid down a Bull of Excommunication against Patriarch Michael Keroularios. The Patriarch responded in kind, and the schism, exacerbated by the Crusades, has continued to divide the Church ever since. The Crusades drove the final wedge between the Church in the West and the Church in the East, particularly at the sack of Constantinople in 1204. So, while the Crusades mark Europe’s recovery from the Dark Ages (ca 700–1000), for Sir Steven Runciman the sack of Constantinople by the Fourth Crusade in 1204 was the culmination of the mounting dislike and suspicion that western Christendom felt towards Byzantium. That misunderstanding of Byzantium and the East makes it worth our while spending some time this evening redressing that balance, and looking at the history of the Church in the East as it developed in its golden age at the high point of the Eastern Roman or Byzantine Empire. The Byzantine period begins with the First Seven Ecumenical Councils, and encompasses more than 11 centuries from the First Council of Nicaea in 325 to the Fall of Constantinople in 1453. Long before the Crusades, much of the agenda was set in historic memories with the conflict between the Persian and Roman Empires. This was a protracted struggle from 92 BC to 627 AD and was, arguably, a continuation of the Greco-Persian Wars. But this phase of the conflict so drained both the Persian and Byzantine empires that once the conquests of Muhammad started empire could effectively resist the onslaught, and Persia fell to the Arabs. Following the death of Muhammad in 632, the Arab Muslim world expanded vigorously, bringing about a series of wars between the Muslim Caliphates and the Byzantine Empire. The initial conflict, from 629, ended with the Second Arab Siege of Constantinople in 717-718 that halted the rapid expansion of the Umayyad dynasty into Asia Minor. However, these conflicts would continue from the 9th century, and as we saw, the Arab victories resulted in the request from the Byzantine Emperor Alexios I Komnenos for military aid and the response from Pope Urban II in 1095 that led to the First Crusade. What was happening in the Eastern Church at time that could produce that wonderful account of the Slav envoys when they reached the great Church of Aghia Sophia in Constantinople? What was so vigorous in Church life in the East that it stimulated a spiritual life associated with the Jesus Prayer, great works of iconography, and an expression of the Christian faith that would survive the dominance of Islamic rule under Arabs, Persians and Turks for centuries, and continue survive and sustain and nourish people through the vicissitudes of Eastern Europe for most of the 20th century? Sometimes, Patriarchs (often of Constantinople) were deposed by the emperor; at one point emperors sided with the iconoclasts in the 8th and 9th centuries. But the internal divisions were often nothing compared with the great chasm that opened between East and West. The cracks and fissures in Christian unity that led to the East-West Schism started to become evident as early as the 4th century. Although 1054 is the date usually given for the beginning of the Great Schism, there is, in fact, no specific date on which the schism occurred. What really happened was a complex chain of events whose climax culminated with the sacking of Constantinople by the Fourth Crusade in 1204. The events leading to schism were not exclusively theological in nature. Cultural, political, and linguistic differences were often mixed with the theological. So, while the eastern and western parts of the Church professed loyalty to the faith and authority of the seven ecumenical councils, the divisions beneath the surface soon began to become visible. The transfer of the Roman capital to Constantinople inevitably brought mistrust, rivalry, and even jealousy between the two great sees, Rome and Constantinople. Constantinople grew in confidence, and this confidence was expressed visibly in the 530s when the second Church of the Holy Wisdom (Aghia Sophia) was built in Constantinople under the Emperor Justinian I. The first church was destroyed during the Nika riots. 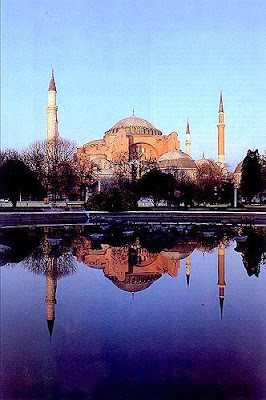 The second Aghia Sophia would become the centre of the ecclesiastical community for the rulers of the Eastern Roman Empire or Byzantium. Justinian embarked on a triumphal building programme that also included the fortified Monastery of Saint Catherine on Mount Sinai. The estrangement of East and West was aggravated by the German invasions in the West, intensified by the rise of Islam and its conquest of most of the Mediterranean coastline, and continued with the arrival of the pagan Slavs in the Balkans, all helping to drive a wedge between the worlds of the Old Rome and the New Rome. By the end of the seventh century, communication between the Greek East and Latin West had practically ceased. ●the debates about the procession of the Holy Spirit. These doctrinal novelties were first openly discussed during the patriarchate of Photius I.
Rome began to interpret its primacy within the heptarchy in terms of sovereignty, abandoning the collegial and conciliar nature of the Church in favour of the supremacy of papal power. These ideas were finally given systematic expression in the West during the Gregorian Reform movement of the 11th century. The Eastern Churches viewed Rome’s understanding of the nature of episcopal power as directly opposed to the essentially conciliar structure of the Church. The two sees developed two ecclesiologies that became mutually antithetical. Rome based its claims to “true and proper jurisdiction” on its claims to apostolic foundation by Saint Peter and an exegesis of Matthew 16: 18. On the other hand, the Eastern Church could not accept Saint Peter’s primacy as the exclusive prerogative of any one bishop. All bishops must, like Saint Peter, confess Jesus as the Christ and, as such, all are Saint Peter’s successors. The churches of the East conceded the Roman See had primacy but could not concede supremacy. The Pope could be the first among equals, but not infallible and not with absolute authority. The other major difference was expressed in the filioque debate or the debate on the procession of the Holy Spirit. This debate developed gradually and the insertion of the filioque was almost unnoticed. In addition to the dogmatic issues raised by the filioque, the Byzantines argued that the phrase had been added unilaterally and, therefore, illegitimately, since the Orthodox had never been consulted. For the Orthodox, an ecumenical council alone could introduce such an alteration, but the councils had expressly forbidden any subtraction or addition to the text. Meanwhile, the Church in the East faced its own internal problems. We often consider icons as one of the most visible expressions and marks of the Eastern Church. But icons were at the centre of one of the principal disputes to rock the Eastern Church in the eighth century. Leo III became Emperor of Byzantium in 717 with the support of the army. In 726, with the support of the same army, he began to suppress the use of icons. He ordered the removal and the destruction of the great golden icon of Christ that stood over the bronze gates of the Imperial Palace, facing Aghia Sophia. His command sparked riots on the streets, but Leo was not for turning and in 730 he issued an edict prohibiting all sacred images except the Cross. Icons were whitewashed, liturgical robes were burnt, relics were smashed. Pope Gregory II sent ships to Constantinople to arrest the Emperor, but they sank on the journey. Leo’s son, Constantine V continued these policies, and even forbade the use of word “saint.” The attacks then spread to monasticism, with monasteries attacked, libraries burned, monks’ beards cut off, and monks and nuns told to choose between marriage and exile. Saint John of Damascus, the most articulate advocate of icons, was excommunicated. But when Constantine died in 780, his daughter-in-law, the Empress Irene, became Regent. She called the Second Council of Nicaea (787), the Seventh Ecumenical Council and ended the Iconoclast controversy after 30 years. By then, however, much of the Church’s art had been destroyed with the excuse of ending what was seen as the veneration of “graven images” (see Exodus 20: 4). There was a second period of iconoclasm (813-843), but it ended at the Council of Constantinople in 843 when the Empress Theodora reaffirmed the rulings of Nicaea II in 787. Meanwhile, in the 9th century, a further controversy dividing East and West developed when Pope John VII opposed the appointment of Photios I as Patriarch of Constantinople by the Byzantine Emperor Michael III. The Pope refused to apologise to the Patriarch over previous points of dispute, Patriarch Photios refused to accept the supremacy of the Pope in Orthodox matters or to accept the filioque clause, although the Latin delegation at his consecration pressed him to accept in order to secure their support. There were differences too over which great see was owed loyalty by the Church in Bulgaria. Photios offered some concessions on the question of Bulgaria and the papal legates returned to Rome. However, this was a short-lived concession, and Bulgaria returned to Byzantium’s orbit in 870. During these controversies, the Serbs became Christians during the reign of Heraclius (610-641). A century later, in 732, the whole Balkans came under Byzantine jurisdiction. Then, in the ninth and tenth centuries, Christianity was introduced among the Slavs in Eastern Europe, first in Bulgaria and Serbia, then in Kievan Rus, in missions initiated during the reigns of the Patriarch Photios (858-867 and 877-886). The Byzantine missionary brothers, Saint Cyril and Saint Methodius, put the Slavic language into writing, creating a new alphabet, and they also translated the Bible and the liturgy into Slavonic. But missionaries from Germany insisted on the use of Latin and resisted the use of Church Slavonic. In the midst of this friction and dissension, the brothers travelled to Rome to seek the Pope’s intervention. Although Pope Hadrian II (867-872) made Methodius Archbishop of Sirmium in Serbia, he was later jailed and Pope John VIII (872-882) instructed him to stop using Slavonic, and his successors adopted a Latin-only policy for the Western Church. However, the Serbs and the Bulgarians adopted the Old Slavonic liturgy rather than either Greek or Latin. In 863, a mission from Constantinople converted King Boris I of Bulgaria to Christianity. But a popular revolt against the new religion prompted the king to seek independence from Constantinople for the Bulgarian Church. When Constantinople refused, Boris turned to the Pope, and in August 866, a Bulgarian mission arrived in Rome with a list of 115 questions on the Christian way of life and a future Bulgarian Church under Roman jurisdiction. On 13 November 866, the Bulgarian King was presented with the Pope’s 106 answers by Bishop Formosa of Portua and Bishop Paul of Populon, who led the Pope’s mission to Bulgaria, and the arrival of the Roman mission ended the Byzantine mission in Bulgaria. A pro-Rome Bulgaria threatened Constantinople’s immediate interests. The Roman Church was condemned at a Church Council in Constantinople in 867, and with the support of the Byzantine Emperor Michael III, Pope Nicholas I was anathematised. The old rivalry between the two Churches, between the Old Rome and the New Rome, burned with new power. However, Pope Nicolas I soon died and his successor, Pope Hadrian II (867-872), proved to be less amenable to King Boris. Boris now re-entered talks with Constantinople, and an autonomous Bulgarian Church was agreed to, just six years after Boris had converted to Christianity. Over the next 10 years, Pope Hadrian II and his successors made desperate attempts to recover their influence in Bulgaria and to persuade Boris to leave Constantinople’s sphere of influence, but their efforts ultimately failed. With the foundation of a Bulgarian Church, the next stage was the introduction of Slavonic Liturgy, using the Slavic alphabet. The success of the conversion of the Bulgarians facilitated the conversion of other East Slavic people, most notably the Rus, the predecessors of Russians, Belarusians and Ukrainians. By the beginning of the 11th century most of the Slavic world, including, Bulgaria, Serbia and Russia had converted to Orthodox Christianity. Bulgaria’s Patriarchate was recognised by Constantinople in 927, Serbia’s in 1346 and Russia’s in 1589. The traditional event associated with the conversion of Russia is the baptism of Vladimir of Kiev in 989, when he married the Byzantine Princess Anna, sister of the Byzantine Emperor Basil II. In the 11th century, the East-West Schism between Rome and Constantinople was formalised, leading to the separation of the Latin Church and the Orthodox Church. My dearest brother, we do not deny to the Roman Church the primacy among the five sister patriarchates and we recognise her right to the most honourable seat at the Ecumenical Council. But she has separated herself from us by her own deeds when through pride she assumed a monarchy which does not belong to her office ... How shall we accept decrees from her that have been issued without consulting us and even without our knowledge? If the Roman pontiff seated on the lofty throne of his glory wished to thunder at us and, so to speak, hurl his mandates at us from on high and if he wishes to judge us and even to rule us and our churches, not by taking counsel with us but at his own arbitrary pleasure what kind of brotherhood, or even what kind of parenthood can this be? We should be the slaves not the sons, of such a church and the Roman see would not be the pious mother of sons but a hard and imperious mistress of slaves. The final breach between Greeks and Latins is often considered to have arisen after the capture and sacking of Constantinople by the Fourth Crusade in 1204, which included sacking the Church of Holy Wisdom, the destruction of the Monastery of Stoudios and the Library of Constantinople and establishing a Latin Empire based in Constantinople and spread throughout Asia Minor and Greece, including Thessaloniki and Cyprus. This is still viewed with rancour in the East to this day, seen as weakening Byzantium and leading to the eventual fall of the Empire to Islam. After Constantinople was sacked in 1204 by the Fourth Crusade, much of Asia Minor was brought under Roman Catholic rule and the Latin Empire of the East. After the fall of Constantinople, the Empire of Nicaea was established and gave rise to the later Greek monarchy that defeated the Latin forces of Europe and re-established Orthodox Monarchy in Constantinople and Asia Minor. Throughout all this time there was an immense growth in the spiritual life of the Church, typified by the development of monastic life in places such as Mount Athos, Patmos and Mount Sinai. 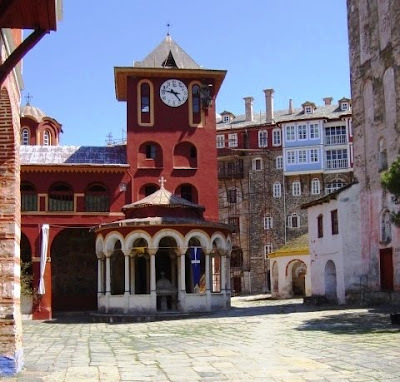 Mount Athos (Όρος Άθως or Άγιον Όρος) is a mountain and peninsula in Northern Greece that is home to 20 monasteries that come under the direct jurisdiction of the Patriarch of Constantinople. Monks have been there since the fourth century, and possibly since the third. The historian Genesios recorded that monks from Mount Athos took part in the 7th Ecumenical Council of Nicaea (787). Following the Battle of Thasos in 829, Mount Athos was deserted for some time due by Saracen raids from Crete. Around 860, the monk Efthymios the Younger came to Mount Athos and a number of monk-huts or skete were created around the place he lived. During the reign of Emperor Basil I, the former Archbishop of Crete (and later of Thessaloniki) Saint Basil the Confessor built a small monastery at the place of the modern harbour of Hilandariou Monastery. Soon after, a document of 883 states, a monk named Ioannis Kolovos built a monastery at Megali Vigla. The Athonite monasteries hold huge deposits of invaluable mediaeval art treasures, including icons, liturgical vestments and religious objects, codices and other Christian texts, imperial chrysobulls and holy relics. Until recently, no organised study and archiving had been carried out, but an EU-funded effort to catalogue, protect and restore them is under way since the late 1980s. Their sheer number is such that it may take several decades before the work is completed. The practice of Hesychasm has it beginnings in the Bible (see Matthew 6: 6) and the Philokalia. The tradition of contemplation with inner silence or tranquillity is shared by all Eastern asceticism having its roots in the Egyptian traditions of monasticism exemplified by such Orthodox monks as Saint Anthony of Egypt. About 1337, Hesychasm attracted the attention of a learned member of the Orthodox Church, Barlaam, a Calabrian monk who was Abbot of Saint Saviour’s Monastery in Constantinople. Barlaam came in contact with the Hesychasts when he visited Mount Athos and read the works of Saint Gregory Palamas. Hesychasm is a form of constant purposeful prayer or experiential prayer. It focuses the mind on God and prays to God unceasingly. The hesychasts stated that at higher stages of their prayer practice they reached the actual contemplation-union with the Uncreated Divine Light or photomos seen at the Transfiguration. Barlaam was scandalised by Hesychasm. As a Scholastic theologian, he taught a more intellectual and propositional approach and regarded the hesychasts’ teachings on the nature of the uncreated light as heretical and blasphemous. The great defender of the hesychasts was Saint Gregory Palamas, an Athonite monk and later Archbishop of Thessaloniki. He defended Hesychasm at three synods in Constantinople in the 1340s. The Council of 1341 condemned Barlaam, who recanted and returned to Calabria, later becoming a Roman Catholic bishop. The followers of Barlaam had a brief victory at a later synod, but a synod in 1351 called by the Emperor John VI Kantakouzenos, the Hesychast teachings as set out by Saint Gregory Palamas were definitively accepted by the Orthodox Church. 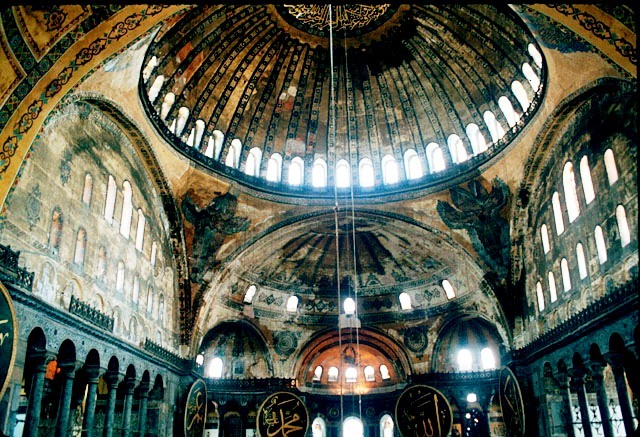 In 1453, the city of Constantinople, the last stronghold of the Byzantine Empire, fell to the Ottoman Turks. But the riches of Orthodoxy were not confined to Byzantium. Nor did they fade away after the Fall of Constantinople. Instead, the exodus of highly educated Greek scholars in the 15th century, later reinforced by refugees following the fall of Constantinople, had a significant influence on the first generation of the Italian Renaissance, including Petrarch and Boccaccio. Later a similar exodus and flight from Crete when it was captured from the Venetians by the Ottoman Turks, would provide another wave of cultural influence throughout Europe. However, Orthodoxy survived under the Ottoman Turks and remained strong in Russia, where Moscow started to call itself the Third Rome as the cultural heir of Constantinople. Four EU member states have an Orthodox majority– Greece, Cyprus, Romania and Bulgaria. How did Orthodox spirituality sustain the people in Soviet Russia or in Ceausescu’s Romania? What was the role of faith in the horrors of ethnic cleansing in the former Yugoslavia? What form of spirituality is sustaining the people of Greece in their current economic and political crisis? Who are the Christians caught between the extremes of militant Zionism and militant Islam in the Middle East? Or, how should I behave when I visit a church while on holiday in Greece, Cyprus or Russia? Today, the largest Orthodox Churches are the Russian and the Romanian churches, but the most ancient of the Orthodox churches of today are the Churches of Armenia, Constantinople, Alexandria (which includes all of Africa), Georgia, Antioch and Jerusalem. The Church of Greece became independent following Greek independence in the 19th century, and the Archbishop of Athens, was recognised by Constantinople in 1850. The Church of Egypt in Alexandria is separate and distinct from the Coptic Orthodox Patriarchate of Alexandria since the Christological controversies and debates at the Council of Chalcedon (451). Today, the Patriarchate of Alexandria in Egypt has 300,000 Orthodox Christians. Russia was never part of the Ottoman Empire and was recognised by Constantinople in 1589. The Patriarchate of Moscow, which was abolished by Peter the Great, was restored in 1917. The Romanian Orthodox Church is the largest self-governing Church after Russia. It was declared autocephalous in 1885 and became a patriarchate in 1925. The life of an Orthodox Christian is one of prayer. In the Orthodox tradition, it is the person who truly prays who is a theologian and a God-seer. The purpose of all life is to be filled with the Holy Spirit and to become one with Christ, so that we may “become participants in the Divine Nature” (II Peter 1: 4), or Θέωσις (theosis) as it is called in the Orthodox tradition. Everything an Orthodox person does should be to further the goal of living a life of active love for all people. A life of prayer is filled with mercy, forgiveness and love. For the Orthodox, prayer is doxology, praise, thanksgiving, confession, supplication and intercession to God. “When I prayed I was new,” wrote a great Orthodox theologian, “but when I stopped praying I became old.” For the Orthodox, prayer is the way to renewal and spiritual life, is being alive to God, is strength, refreshment and joy, is a personal dialogue with God, is a spiritual breathing of the soul, is a foretaste of the bliss of God’s kingdom. The Orthodox teach that God does not ask us to talk with him using beautiful words, but to talk to him from a beautiful soul. For that, we need no particular eloquence. He hears us no matter how softly we speak, he understands us even when we say little. All hours are appropriate and all places good. It is sufficient that we want to pray; learning comes after that. However, there are some specific aspects of Orthodox spirituality that should be noted here: the Liturgy; Daily and Personal Prayer; Icons and Prayer; the Jesus Prayer; and the monastic life. Orthodox prayer, both public and private, is also marked by the use of icons, and, in a very developed way, by the use of the Jesus Prayer. Through the traditional use of icons, the Orthodox Church has had a remarkable influence, not just on aesthetic considerations, but on our theological journey too. 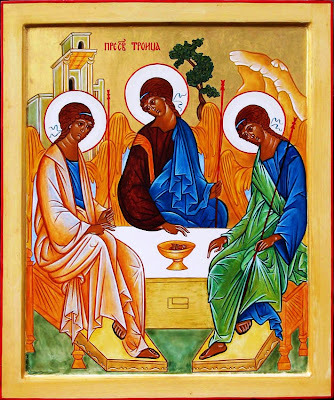 Our understanding of the Trinity, for example, has been transformed by the way in which many theologians have come to a fresh way of talking about the Trinity because of insights developed through Andrei Rublev’s icon of the Visitation of Abraham. The icon of Christ in the chapel of the Church of Ireland Theological Institute is a copy of the earliest surviving icon of Christ, from Saint Catherine’s Monastery on Mount Sinai. The dispute over the doctrinal orthodoxy of icons and their place in the Church was settled at the seventh Ecumenical Council in 843. Icons are part of the heritage of the undivided Church before the Great Schism. 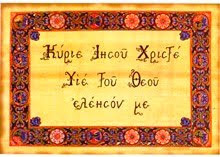 The Jesus Prayer, also called the Prayer of the Heart by some Church Fathers, is one of the best known spiritual traditions within Orthodoxy. It is simple: Κύριε Ἰησοῦ Χριστέ, Υἱὲ Θεοῦ, ἐλέησόν με τὸν ἁμαρτωλό (Lord Jesus Christ, Son of God, have mercy on me the sinner). This short, simple prayer has been widely used and taught throughout history. For the Orthodox, it is one of the most profound and mystical prayers. It is often repeated continually as a part of personal ascetic practice. The theology of the Jesus Prayer was most clearly set out by Saint Gregory Palamas (1296-1359), and its practice is an integral part of Hesychasm, the subject of the Philokalia, a collection of texts on prayer compiled in the late 18th century that has become a key compendium of Orthodox spirituality and prayer. The practice of repeating the prayer continually dates from at least the 5th century. 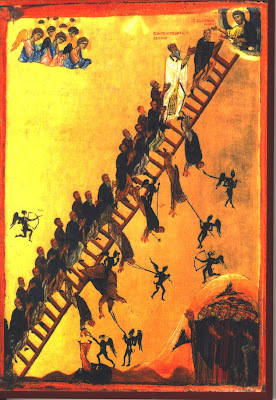 It is first referred to in the writings of Saint Diadochos of Photiki (400-486), is described by Saint John Cassian, who died in 435, and is recommended by Saint John Klimakos of Mount Sinai (523-603) in The Ladder of Divine Ascent. Today, Mount Athos is a centre of the practice of the Jesus Prayer. (Bishop) Hilarion Alfeyev, The Mystery of Faith (London: Darton, Longman & Todd, 2002). E Kadloubovsky and GEH Palmer, Writings from the Philokalia on Prayer of the Heart (London: Fabber and Faber, 1992). John Anthony McGuckin, Standing in God’s Holy Fire: the Byzantine Tradition (London: Darton, Longman and Todd, 2001). Graham Speake, Mount Athos: Renewal in Paradise (New Haven and London: Yale University Press, 2002). (Metropolitan) Kallistos Ware (Timothy Ware), The Orthodox Church (London: Penguin, 1997, new ed). (Metropolitan) Kallistos Ware, The Orthodox Way (Crestwood, NY: St Vladimir’s Seminary Press, 2002). 5.2: Seminar: readings in key thinkers in the late Mediaeval Church: Gregory the Great, Aquinas, Francis, &c.
6.1: New questions: Lollards, Hussites and Erasmus. 6.2: Key figures in the Magesterial Reformation: Luther, Calvin and Zwingli. 6.3: Introducing the Anglican Reformation. (Revd Canon Professor) Patrick Comerford is Lecturer in Anglicanism, Liturgy and Church History, the Church of Ireland Theological Institute. This lecture on 17 April 2015 was part of the Church History Elective (TH 7864) on the part-time MTh course, Years I-IV.